Well I'm all broken up about that man's rights. 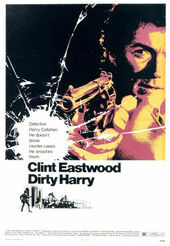 The opening sequence and credits to Don Siegel's Dirty Harry plays long, mean...and breathless? Cream-pie cool Clint Eastwood susses death and a devil atop skyscrapers to a tough Lalo Schifrin score. The soaring set piece sets your teeth on edge, the soft howl of wind an uncomfortable music, the framing tight and majestic. As the camera teeters on the executive producer credit you put your left arm around someone a little too tightly.